She is a professor in the UCLA Fielding School of Public Health's Department of Health Policy and Management and associate director of UCLA's Asian American Studies Center. Ponce led pioneering efforts in multicultural survey research, including measures of racial/ethnic identity, acculturation, generational status, and discrimination. 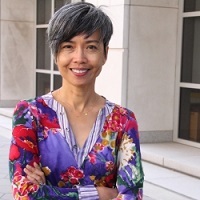 At the Center for Health Policy Research, where Ponce currently serves as principal investigator for the California Health Interview Survey, she devised the rationale and implementation of Asian ethnic oversamples and the cultural and linguistic adaptation of the survey in Chinese (Cantonese and Mandarin), Korean, Vietnamese, and Tagalog. Ponce has played an active role in advocating for expanding survey sampling frames to reflect the diverse immigrant population groups in California’s population. Her research has focused on understanding the effects of macroeconomic changes on health and health care access in developing countries, in low-income neighborhoods and among racial/ethnic groups in the U.S. Her research has received major support from the National Institute of Aging, National Cancer Institute, Robert Wood Johnson Foundation and other organizations. Dr. Ponce has served as RAND's resident advisor to the Republic of Macedonia's Ministry of Health and has worked for the World Bank and Catholic Relief Services in Thailand. She was deputy director of the Asian and Pacific Islander American Health Forum, a national advocacy organization promoting the health of Asian, Native Hawaiian and Pacific Islander communities in the U.S. and US territories. She has also served as a consultant with many community-based organizations including Oakland's La Clinica de la Raza and Asian Health Services. She was also deputy director of the San Francisco-based Asian and Pacific Islander American Health Forum. In addition, Ponce has contributed extensively to professional societies and national committees focused on racial/ethnic disparities research such as the Institute of Medicine’s Subcommittee on the Standardized Collection of Race, Ethnicity and Language Data, and the National Quality Forum Expert Panel on Risk Adjustment and Socioeconomic Status. She was founding chair of the Disparities Interest Group for AcademyHealth and served as the disparities and health equity theme leader for the 2010 and 2014 AcademyHealth annual meeting.